Security Council votes to extend mandate of UN Support Mission in Libya (UNSMIL). The Security Council today extended the mandate of the United Nations Support Mission in Libya (UNSMIL) until 15 June, recognizing the need for a short extension so it can continue working with the country to establish the Government of National Accord. 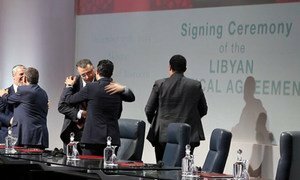 After months of negotiations, a UN-brokered agreement was signed in December 2015 in Skhirat, Morocco, on the formation of a unity government in Libya, consisting of the Presidency Council and Cabinet supported by the other State institutions, including the House of Representatives and State Council. UNSMIL was mandated in 2011 through a Security Council resolution to ensure, among other priorities, transition to democracy, promotion of the rule of law, protection of human rights, control of unsecured arms, and the building of governance capacity, following the revolution which toppled the dictatorship of Muammar Gaddafi. Meanwhile, in today’s resolution extending the mandate, the Council also requested that the UN Secretary-General report within 60 days following consultations with the Libyan authorities on recommendations for UNSMIL’s support to the next phases of the Libyan political transition process. In a press statement yesterday, the Security Council reiterated its support for the Libyan national unity government and renewed its call on UN Member States to end official contact with parallel institutions that claim legitimate authority, but are outside of December’s political agreement. The Security Council today reiterated its support for the Libyan national unity government and renewed its call on United Nations Member States to end official contact with parallel institutions that claim legitimate authority but are outside of the 17 December political agreement.